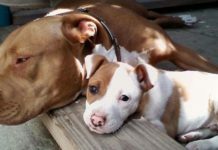 The American Pit Bull Terrier is a dog that often strikes fear into the hearts of people who are looking to adopt one. After all, everyone has heard the horror stories about the ferocious and aggressive nature of these dogs from countless television and magazine articles. They just have to be true, don’t they? Well, in short, no they don’t. 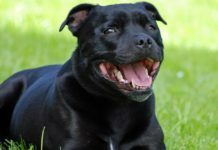 While there have been stories circulating about these types of dogs for over a hundred years now, that doesn’t mean that they are dangerous animals. In fact, I would suggest that they are really just a misunderstood breed of dog. While there may be individual dogs of any breed that may be dangerous, as a whole this breed of a dog isn’t dangerous. However, they do have special requirements to ensure that they grow up and remain as safe as any other breed of dog. This includes proper socialization and training, as well as making sure not to mistreat the dog. 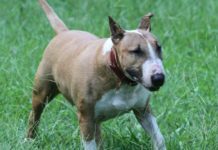 If you can handle those requirements and want to learn a little bit more about this particular breed, then pull up a chair and let me tell you everything I know about this particular breed of dog. Although its name would suggest otherwise, the American Pit Bull Terrier (APBT), is actually a breed that originated in Europe during the 1800s. 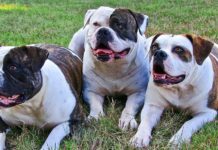 This is when dog enthusiasts in Ireland, Great Britain, and Scotland began crossbreeding various terrier and bulldog breeds with one another. Their goal was to produce an entirely new dog breed that was not only gentle and friendly around their owners but also a breed that was strong and fearless. This new dog breed would eventually make its way to the New World as immigrants began migrating to the United States from these countries. Quite naturally they brought these dogs with them and pressed them into service as work dogs on farms and ranches. On these farms and ranches, these dogs really proved to their owners just how valuable they were to them. They seemed custom made for the jobs they were given by farmers and ranch-hands. These dogs could easily catch and corral cattle and feral pigs; they were excellent when used as a bird dog during a hunt and they could drive cattle as needed. However, the most important role that these dogs had to assume was the role of a companion in the home—a role in which they did not disappoint. Today, this breed of dog continues to exhibit all of the characteristics that a fan of this breed would expect them to exhibit: strength, loyalty and courage. This is true whether they are working on a ranch, on a farm or living in the city. The American Pit Bull Terrier is a breed that has a solid build and is considered by most experts to be a medium-sized breed, weighing anywhere between 30 to 100 pounds. These dogs are stocky and have a short coat and can be just about any natural dog color that you can imagine. The wide variety in fur coloring is due to the fact that this breed is a mix between different Terriers and English Bulldogs. The body of the AMPBT is fairly long and these dogs usually possess a short tail that ends in a point. However, this breed’s most defining characteristic has to be its head. It’s often described by pit bull enthusiasts as being sculptured. Let’s take a look at a few of the characteristics of this breed’s head. The head of this particular breed is what most people think about when they use the term pit bull. It has a head that is fairly large and broad and gives the viewer the impression that this animal is quite physically powerful. Many people have referred to the head shape of this dog as being wedge-shaped, which it is except at the point where the cheeks protrude from this wedge configuration. This “forehead” of this dog forms parallel lines with its muzzle with a rather steep stop in between them. Muzzle length is approximately a 2:3 ratio with the length of the skull. These dogs usually have well-developed lower jaws that are both deep and wide. Another interesting characteristic of this dog breed is that it has well-defined suborbital arches above its eyes. This can give the animal the ability to look inquisitive when the animal in question has the appropriate dark coloring above the eyes. This breed of dog is not only chock-full of confidence but is also quite an enthusiastic dog breed as well. These dogs tend to be eager to please and full of energy. While they have unfairly received the stigma of being an aggressive dog, that is not the case. 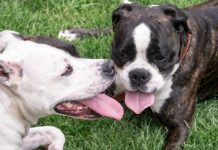 Sure, any particular type of dog can display aggressive behavior towards humans – especially if they had been mistreated or haven’t been properly socialized and trained. Normally, however, these dogs are usually very good-tempered and are usually very good around children. It’s also usually very friendly, which makes them a poor choice for a guard dog since many of them are overly friendly even to strangers. Of course, you should never leave an infant or small child unsupervised with any dog breed. Something else to consider is that while these dogs may bond well with children in the household, they may tend to observe children who live outside the home as a threat and become aggressive. They may also become aggressive with other dogs – especially other pit bulls. While it might not be possible to completely eliminate these behaviors, you can reduce the possibility that they occur by taking the steps to ensure your dog is properly socialized and trained from a puppy onward. The energy level of the APBT is very high, which not only makes them good work animals for farms and ranches but also means that it does very well in any job that requires an intelligent dog with the willingness to work hard. However, this can also be a double-edged sword for its owners because it also means that these animals need a lot of daily exercise and attention. These dogs get bored quite easily and are quite athletic, so that’s something that any potential American Pit Bull Terrier owner is going to want to consider. It also has a very high prey drive due to the fact that these animals were originally bred to chase and take down livestock that may have wandered off of the farm. When you pair its high energy and prey chasing drives with its incredible ability to climb fences, then you have a dog that could be easily labeled as a potential flight risk. Due to their high intelligence and even higher energy levels, American Pit Bull Terriers often become easily bored. And when they become bored they can become destructive. This will lead to behaviors such as extreme digging or simply chewing up every object in your home. If you’re away from your home a lot and don’t have a lot of time to spend with an animal, then this is the last dog in the world you’re going to want to get. One thing that people don’t realize about this breed of dog is that they can be very vocal. While there are plenty of members of this breed which remain the strong and silent type, most of the ones I’ve been in contact with are quite vocal. They aren’t afraid to yip or make other types of noises to get your attention. Before I begin this section, I want to tell you this. Every single dog breed has the potential to develop health issues. While there are certainly health issues that affect one breed of dog more than another one, it doesn’t mean that it’s impossible for a dog breed to get a particular disorder or health condition. All that you can do is to keep your dog as healthy as possible, take him/her to the vet on a regular basis and hope for the best. With that being said, here are some of the particular health conditions which may afflict the APBT. One of the biggest health problems that these dogs face is Hip Dysplasia. This condition – also known as Canine Hip Dysplasia – is a skeletal disease that’s common to many different dog breeds. It’s basically a malformation of the hip ball and socket which can lead to severe arthritis as the dogs age. It can be caused by environmental factors such as rapid weight gain or nutritional problems or it can be caused by genetic factors. Either way, it can cause severe pain in the dog and eventually lead to a loss of mobility. Another common health problem with the American Pit Bull Terrier is Hypothyroidism. Hypothyroidism is the result of impaired thyroid production in the dog probably due to damage that was done to the dog’s thyroid gland. This damage is usually caused by the dog’s own immune system, and not outside factors, as the animal’s immune system begins to mistake the dog’s own thyroid gland as an invading organism and sets out to destroy it. This disease can cause symptoms which range from fur loss to a dry skin and coat; to weight gain and fearfulness, to aggression and/or the development of other skin conditions. 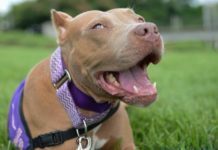 Many states have some form of Breed Specific Legislation (BSL) concerning the American Pit Bull Terrier. Which is really just a fancy way of saying that there are laws specifically addressing this particular breed of dog. In some states, it’s not legal to own one of these dogs, while in other states it might be just fine to own one. And there may be all kind of other rules and regulations concerning this dog breed. At the time of this writing, there were quite a few U.S States which had some form of BSL. 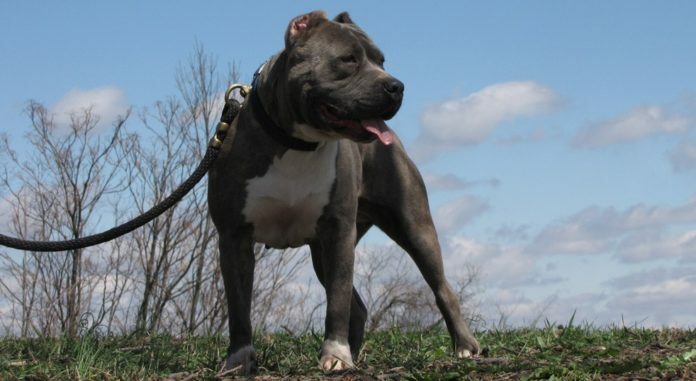 Before you try to get this type of pit bull, be sure that you make sure that it’s legal to own one in your area and that you follow all rules and regulations about owning them. As you can clearly see, the APBT is a dog that has been given a maligned reputation over the past 150 years or so. A reputation they don’t deserve. After all, these dogs are just as friendly, loyal and family friendly as any other type of dog – maybe even more so. Sure, these animals are powerful dogs and are quite exuberant but that doesn’t mean they are overly aggressive or violent, if they are treated well. 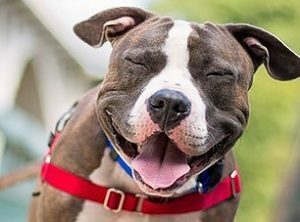 As gregarious as American Pit Bull Terrier dogs are, however, they aren’t a breed suitable for everyone. They are best suited for owners who are going to spend a lot of time with them, provide them a big yard to play in and will make sure that they are well-cared for, socialized and trained. For these people, this dog is the best dog for them.